I inhabit the virtual world of second life and love to take pictures and decorate my home. I’ve been blogging for 1 year and I don’t know if I’ve found the magic formula or if I’m any good yet. Sometimes I stop to wonder and then I get right on to trying harder just in case I haven’t. Sometimes I need to be poked back into consciousness since it’s rather therapeutic the act of setting up a scene and then taking pictures and trying to make it the best it can be. I’m usually happy enough if I get over half way close to how I imagined it. That doesn’t mean I won’t twist and rotate every tiny little thing to death trying to get it exactly right. 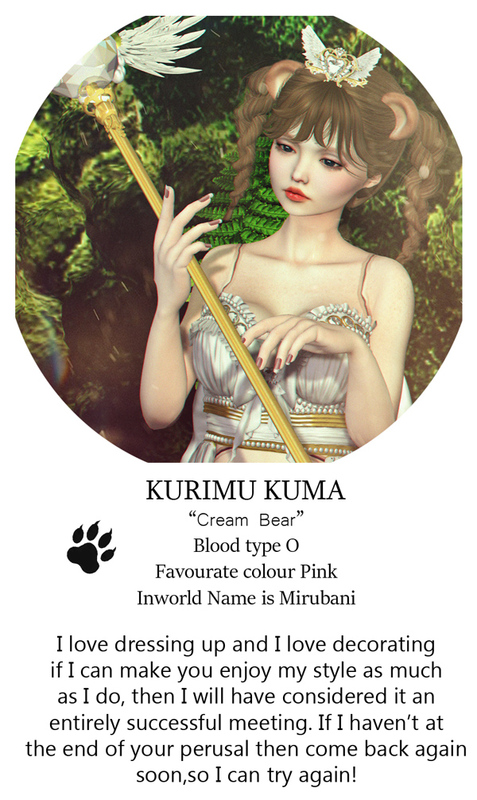 In-world I am Parfait Kurimu Kuma, Mirubani resident. Feel free to say hello, I don’t mind at all. I like to explore stores just as much as I shop my favourates. Most of my favourate shops are all shops I fell in love with in my early days of joining Second Life and shopping for the first time. Unfortunately (or fortunately) I am a creature of habit. I get set in my comforts and sometimes I like to shake myself loose from my usual haunts and find a new store or a new creator that I have never met before.